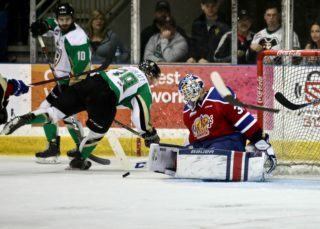 Lethbridge, AB – The Prince Albert Raiders (7-0-0-0) continued their strong start to the season with a 5-1 victory over the third ranked Lethbridge Hurricanes (2-3-0-0) at the Enmax Centre on Friday night. 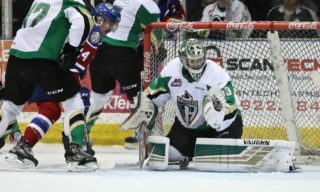 San Jose Sharks draft pick Noah Gregor had a pair of shorthanded goals – including the game winner – and an assist for the Raiders, who are ranked fourth in the Kia CHL Top 10. Montreal Canadiens pick Cole Fonstad iced the game with two goals to start the third. Ottawa Senators signee Parker Kelly also had a pair of assists in the win. Toronto Maple Leafs draft pick Ian Scott kept the Raiders in the game during the first period. The Calgary product turned aside 20 of the 21 shots fired his way by the Hurricanes in the period. The lone blemish was when Taylor Ross finished off a backdoor pass from Dylan Cozens at the 9:24 mark of the period. As the Raiders pushed back at the end of the period, Reece Klassen kept the Hurricanes up one with a breakaway save on Spencer Moe. The Raiders got on the board 6:26 into the second period. Sergei Sapego’s shot from the top of the left faceoff circle beat Klassen, extending the Belarusian’s point streak to seven games this season, and eight dating back to last year. SCORES! Sergei Sapego’s shot through traffic finds the back of the net! Four minutes later, Gregor tallied his first shorthanded goal of the game. Kelly forced a turnover and carried the puck into a two-on-one with the Beaumont product. Kelly tossed a saucer pass to Gregor, who shot it over a sprawling Klassen. SCORES! @n_gregs20 gets his first as a Raider. It comes on a shorthanded two-on-one with @Parks_17! In the third, the Raiders got off to a quick start thanks to Fonstad. 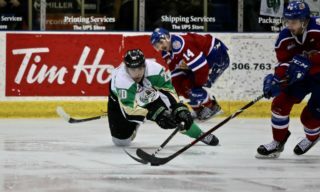 The Estevan product pounced on a loose puck in front of the net thrown there by Gregor just 20 seconds into the period. Two minutes later, Fonstad was the beneficiary of great work in the corner by Kody McDonald. The 20-year-old dug the puck out, then found Moe who centered for Fonstad. SCORES! Cole Fonstad finds a puck in the crease and puts it home 20 seconds into the third! SCORES! Cole Fonstad with his second of the period! Late in the period, with the Raiders down two men for the second time on the evening, Gregor added an empty-net goal from deep in his own zone. Scott continued his strong performance throughout the game, fighting through traffic for a 31-save outing. Klassen finished the game with 35 saves in the loss. 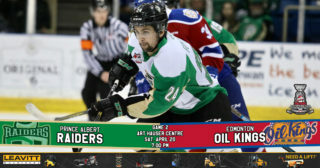 The Raiders head to Red Deer tomorrow night to square off against Rebels (4-2-0-0) as the second half of the Central Division trip begins. Puck drop is 7 p.m. Catch the game at The Rock And Iron Sports Bar, the official watch party for all Raider road games. 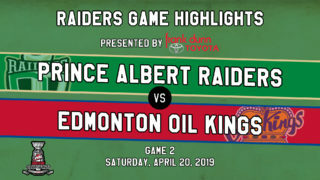 The next Raiders home game is on Saturday, October 13 against the Red Deer Rebels on Parker Kelly Bobblehead Night presented by Canadian Tire. Tickets are available at the Raider Office and at tickets.raiderhockey.com.